SIXTY-ONE distressed people were taken from the banks and bridges of the river Foyle last year, according Foyle Search and Rescue. Volunteers also pulled 13 people alive from the water but tragically returned the bodies of two victims to their grieving families. The rescue charity was set up almost 23 years ago in response to the lives being lost in the fast-flowing river Foyle which runs through Derry city and parts of Donegal. 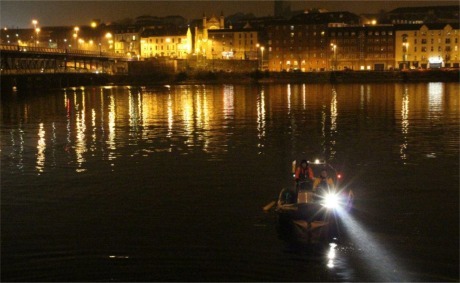 Foyle Search and Rescue on patrol in Derry. Its annual summary reveals that volunteers assisted gardaí in the search for a high-risk missing man last year. They also approached a further 76 people they felt needed help. The charity's volunteers attended a total of 154 incidents and gave 11,000 unpaid hours to the local community last year. "Our statistics for the year do not include the major incident in June in which Foyle Search and Rescue, along with other statutory agencies, rescued 28 people from the water who were in a canoe accident," said a spokesperson, who thanked the local community and other agencies for their ongoing support.